Above-ground swimming pools – Above-ground pools are an economical option for people who want to enjoy summer fun without the high price tag that accompanies an in-ground model. Maintenance is fairly easy; they are kept clean and sanitary through a basic filtration system. 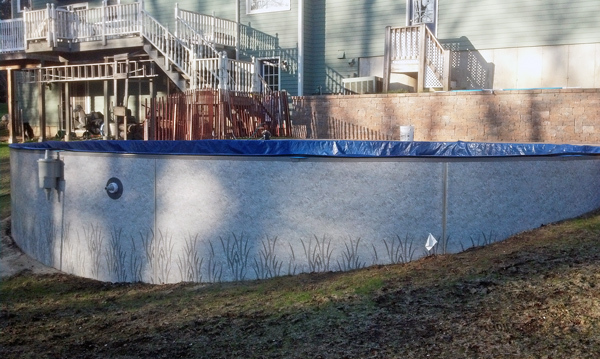 In-ground swimming pools – We install vinyl liner in-ground pools comprised of steel panels that are bolted together. These attractive swimming pools are more economical than you might think; at about $10,000 to $15,000 less than gunite pools. However, they they are just as durable and in our opinion, are a better choice for the rugged New England climate. Salt water swimming pools – We offer salt water pools for people who are unable to tolerate chlorine, due to chemical sensitivity. Swimming in a chlorinated pool can create skin or lung irritation that is very unpleasant. This salt water chlorination method is much gentler on skin and clothing and doesn’t have a harsh odor like traditional chlorine. It’s also saves a pool owner upwards of $600 annually over chlorine. 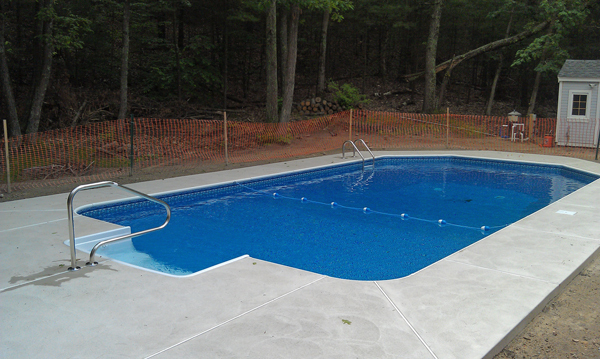 For those who would like to upgrade their chlorinated pool for a salt water option, we offer that service as well.